Skin diseases such as Psoriasis, Eczema, Seborrhoea and Atopic Dermatitis bring a lot of inconvenience to the patients, especially when emerges on the face where it is most noticeable. Fortunately, psoriasis on face is quite rare. Symptoms of face psoriasis is very similar to seborrheic dermatitis as both are manifested by scaly red spots, swollen and sore facial skin. Psoriasis and other skin conditions on the face requires special treatment, as, unlike other parts of the body, the facial skin is thinner and more sensitive. The face treatment kit is a complete treatment for facial conditions such as Psoriasis, Eczema, Seborrhoea and Atopic Dermatitis. With this kit you save $14.85 + Free Delivery compared to buying all the products separately. Facial Psoriasis and Seborrheic Dermatitis often affect the eyebrows, the skin between the nose and upper lip, the upper forehead and the hairline. The skin feels constantly dry, itchy and irritable. Facial Atopic Dermatitis affects all ages and usually appears as dry and scaly patches on the scalp, forehead, round the eyes and behind the ears. Outbreaks are also very common on the cheeks, particularly in babies. Since facial skin is very sensitive, dermatologists do not recommend the use of corticosteroid products since hormonal drugs can cause many side effects. PsoEasy offers natural treatment for psoriasis on the face with safe and effective means. 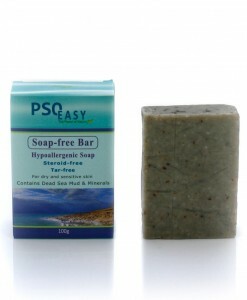 PsoEasy Hypo-Allergenic Soap Bar is a unique combination potent plant extracts, algae and Dead Sea Silt and is distinguished by its ability to penetrate skin pores, cleanse and purify skin thoroughly. 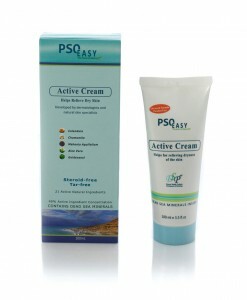 PsoEasy Active Cream is designed to relieve the itching, redness, irritation and dryness of the skin. This cream contains over 20 natural ingredients, including plant extracts, essential oils and Dead Sea minerals. This product extreme effectiveness consists in its high concentration of active ingredients (about 40% or 40,000 mg / 100 g). Meaning more active particles are reaching damaged skin cells. 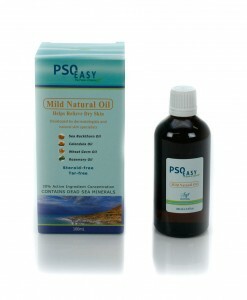 PsoEasy Mild Natural Oil relieves itching, dryness, rashes, as well as irritation of the facial skin. The use of this natural oil helps moisturize and soften the skin and alleviate psoriasis on face. It contains oils of sea buckthorn, grape seed, rosemary, tea tree oil and other essential oils that are incredibly useful for psoriasis on the face treatment. Caution: this product may stain the clothes. To avoid clothes staining, wait until it is completely absorbed. Why choose PsoEasy Face Treatment Kit?